For three generations, Green Harbor Golf Club has been a family-owned and managed 18-hole public golf course with a challenging layout conveniently located between Cape Cod and Boston in Marshfield, Massachusetts. Since its opening in 1971, it has long been known as an impressively maintained course that the whole family can enjoy. 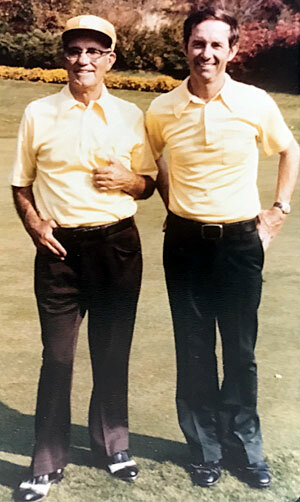 In 1965, the Francis family purchased land in Marshfield and created a turf farm for the development of their propitiatory Vesper Velvet bent-grass. Velvet greens are unmatched for their consistent conditions and true putt-ability and are a preferred turf for private golf courses all over the world. In 1971, Green Harbor Golf Club opened as a public course featuring the same Vesper Velvet greens and conditions that private courses benefit from. Beginner golfers appreciate the wide fairways, while the lower handicapper is challenged by the shot-making accuracy that is required; a testament to this challenge is the standing course record of 67. Water hazards come into play on seven holes, and there are many bunkers and challenging pin placements on the course that are designed to keep this record intact. This course is a must for those who want to experience the old world feel of walking-only golf; golf the way it was intended. The prevalence of golf carts means that golfers are no longer as active as they were back in the day. However, unless you have physical limitations, there is nothing that should prevent you from walking when playing golf. Below are just a few of the benefits of walking instead of riding in a cart. When walking and playing an 18-hole round, you can accumulate up to 10,000 steps and burn an impressive 2,000 calories. Your heart rate can increase to an average of between 111 and 119 beats every minute when walking on the golf course and top at around 150 BPM. This will help to keep your heart in good shape and keep cardiovascular diseases in check. Golf Like most other physical activity will cause the release of adrenaline and also improve your blood flow and metabolism. This in turn leaves you feeling energized, helps you keep stress and anxiety in check, and improves sleep patterns. The few hours of walk and stop when playing golf will not only decrease stress and lower blood pressure as described above, but research also indicates that it increases your white blood cell count which is vital in fighting off infection and boosting your immune system.